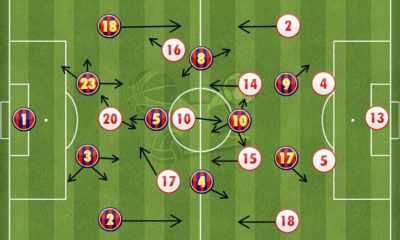 Abhijit Bharali writes a detailed tactical analysis about the La Liga match that ended Sevilla 0-0 Villareal. Sevilla and Villarreal played out a game of percentages that ended in a goalless draw at the Estadio Ramón Sánchez Pizjuán. The home team struggled to break past Villarreal’s last defensive line, partly because of the lack of intensity from their midfielders — the languid duo of Steven N’Zonzi and Samir Nasri. Nasri and N’Zonzi had, by a distance, the most touches as well as the most passes received. However, that didn’t translate into any great advantage for the Andalusian outfit. Sevilla lined up in a purported 4-4-2 with Wissam Ben Yedder and Stevan Jovetić as the two forwards. 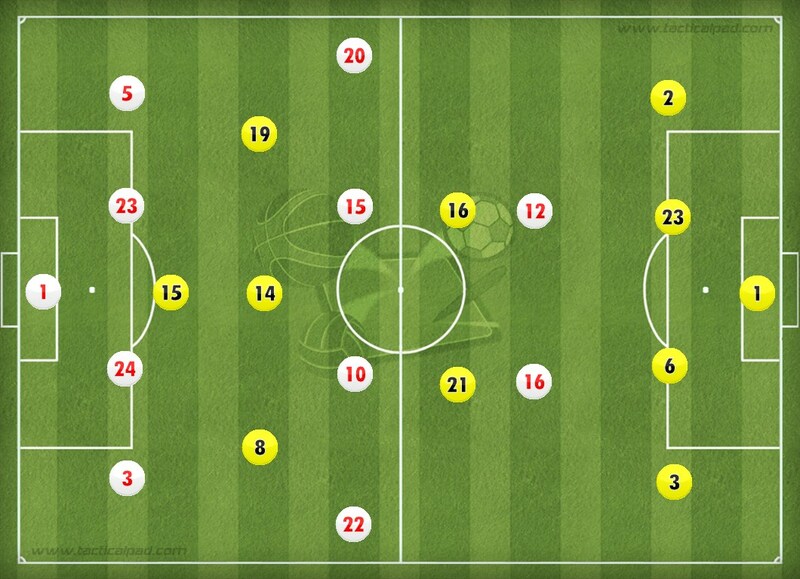 Their 4-4-2 morphed into 3-1-4-2 in possession, facilitating ball circulation through the flanks. Ben Yedder and Jovetić initially played on the Villarreal centre-backs’ shoulders, but the latter gradually dropped deeper to create more access between the lines, as Nasri played more in deep midfield to collect possession from the back. 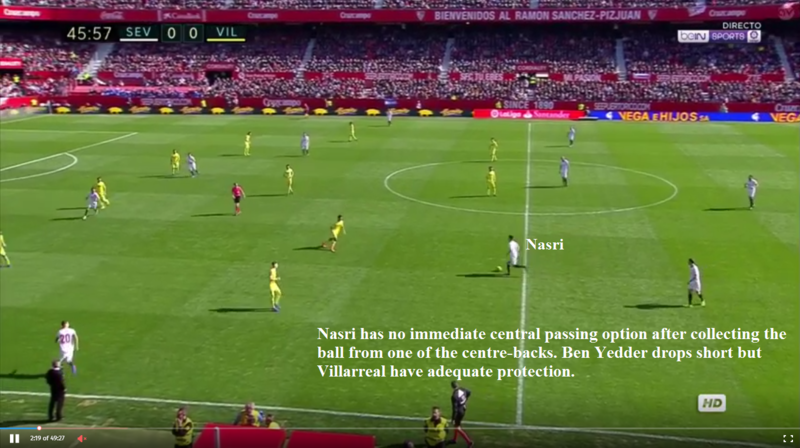 Nasri’s retreating movements hampered Sevilla’s attacking dynamics in that Jovetić aside, none of his team-mates played through the centre between the lines, leaving the attacking midfield zone easy to defend for Villarreal. Gabriel Mercado, Adil Rami, and Clément Lenglet were the three centre-backs in Sevilla’s on-the-ball 3-1-4-2, with N’Zonzi playing as the deep-lying number 6. Franco Vázquez drifted inside from his right-sided role to allow Mariano’s overlapping wing-back movements, while Vitolo on the other side played on his own, combining his one-vs-one and crossing abilities with good work-rate to keep the lid on Mario Gaspar, Villarreal’s flying right-back. Villarreal’s template 4-4-2 had Manu Trigueros playing as the second striker. Trigueros, who has impressed alongside captain Bruno Soriano in a double-six this season, played up front along with January signing Adrián López. Rodri partnered Bruno at the heart of Villarreal’s midfield, while Samu Castillejo and Jonathan dos Santos completed the four-man midfield line. With Mateo Musacchio out injured, Victor Ruiz had Daniele Bonera as his defensive partner. Both Dos Santos and Castillejo supported the full-backs—Gaspar and José Ángel—on their respective sides and helped to create overloads along the touchline to trigger transitions. With Vitolo out wide on the left, Sevilla played mostly through that flank. That allowed Mariano to be an outlet on the far side. Sevilla’s lopsided defensive shape also contributed to their attacking designs. When in defensive transitions, Mariano dropped into the defence making it a line of four. Vázquez made lateral movements that directed Sevilla’s attacks down Vitolo’s side. Such a dynamic had two benefits for Sampaoli’s team. One, they had Mariano playing in the passive zone to allow switches of play by drawing Villarreal’s defenders to one side. Two, Sevilla’s attacking concentration on their left-hand side blunted the threat of Gaspar in Villarreal’s attacks. Nasri holds the key to Sevilla’s attack, but he dropped deep far too often to make his team a force going forward. The Frenchman made it easier for Villarreal’s lines to maintain their shape, and he rarely made a penetrating pass through the middle owing to a lack of numbers there and Villarreal’s numerical superiority in that zone. Most of his passes were to Vitolo out wide and percentage balls to N’Zonzi: not quite the creative stuff. Inside the first minute, Sevilla made a good chance when Ben Yedder peeled away from Bonera for a cut-back from the left edge of the 18-yard box. That particular move was orchestrated by Nasri playing around the hole and showed how Sevilla could stretch Villarreal’s back-line. 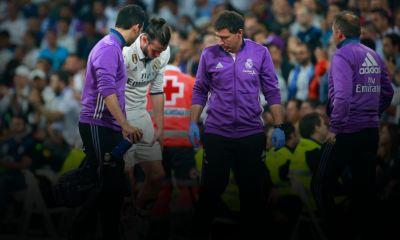 It didn’t come as a surprise such moves didn’t happen more frequently since Nasri dropped back. 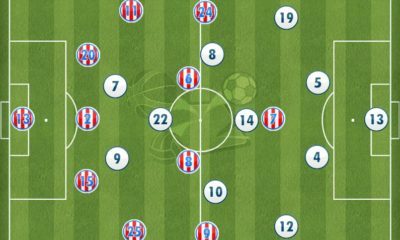 That Jovetić started dropping deeper showed a change in Sevilla’s plans, but any central balls between the lines were received by players in poor body shape. Those backs-to-goal and on-the-half-turn ball receptions by Sevilla’s forwards owed much to the pressure from Villarreal’s square block of the two centre-backs and the pivots who made sure the ball was passed back or sideways whenever it was played between the lines, rendering once promising situations into cul-de-sacs. Furthermore, the void created by Nasri dropping deep forced Sevilla’s forwards to seek the wide players upon receipt of passes. That didn’t, in any way, help stretch the compact Villarreal back-line. Escribá’s side haven’t lost to La Liga’s big four this season which can be attributed to their defensive shape and recycling of the ball in possession. Defensive shape has allowed them to prevent opponents from building promising attacks down the centre, while recycling has helped them to keep the ball from opponents. The latter allows them to build their own attacks and in turn prevent opponents from creating constant pressure. Once again, a similar containing tactic was on display at the Sánchez Pizjuán. Without Nicola Sansone, Cédric Bakambu, and Roberto Soriano, the Yellow Submarine lacked their usual attacking verve, but playing Trigueros up front proved to be an inspired choice from Escribá. 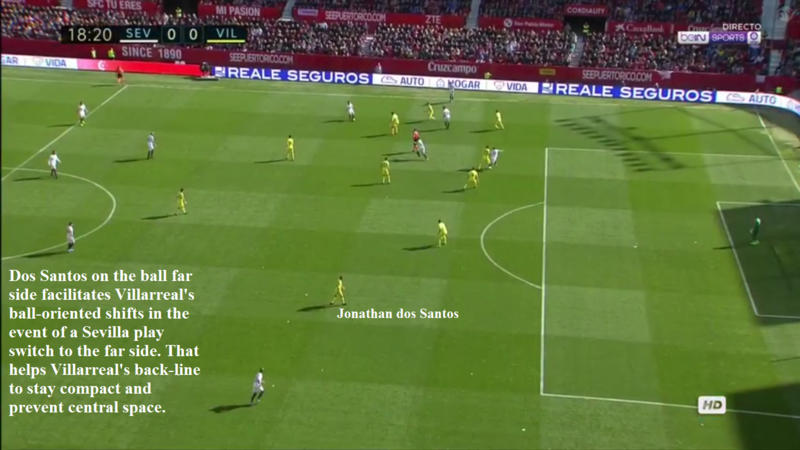 With Dos Santos and Castillejo sitting back, Villarreal’s ball-oriented shifts were consistent. Moreover, Trigueros often helped negate Sevilla’s overloads on a particular flank by joining in to support the wide midfielder-full-back combination. On the occasions when Nasri joined Mariano and Vázquez to create triangles for ball circulation, Trigueros prevented them from developing overloading situations against Ángel and Dos Santos. To be fair to Nasri, it was Villarreal’s disciplined lines that forced him to drop deeper to collect the ball since he was immediately pressed when he received the ball in the centre, between the lines. Moreover, Sevilla’s tactic of drawing defenders and then switching play was rendered ineffective by Villarreal’s consistent indents. On the few occasions when the home side had the advantage after switching play, poor touches and even poorer end products nullified that advantage. One aspect of Sevilla’s play was to get the ball to their captain Vitolo, who could then carry the ball deep into the Villarreal half. But, the issue with Vitolo was his tendency to drift inside on his favoured right foot from his wide position on the left. With no overlapping runs, Sevilla’s left-sided attacks were predictable, and only when Vázquez and Nasri both drifted into the central zones did Vitolo find space out wide. There too, his weaker left side meant Vitolo didn’t pose much threat. After the hour mark, Pablo Sarabia, a natural left-footer, replaced Mariano, and Vitolo shifted to the right wing. 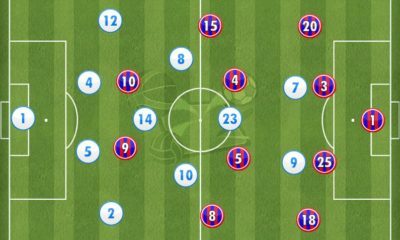 Sevilla switched to a more attacking shape with Sarabia and Vitolo wide on both flanks, as Vázquez moved more central. Villarreal never posed a sustained attacking threat, hence Sampaoli had the liberty to attack with six players in the game’s final half hour. Villarreal are one of the few good-to-watch defensive teams around. Their economical use of the ball led to them having the game’s two most dangerous openings, both of which Adrián contrived to miss. With Villarreal’s selfless desire to not let Sevilla pass through their central ranks, this was a game where Escribá once again outmanoeuvred one of his higher profile counterparts in Sampaoli. The Yellow Submarine were set up to contain, judging by Trigueros’ role as a forward. Their counterattacking threat was minimal but dangerous. Furthermore, they succeeded in stopping Sevilla from scoring which tells a lot about the manager’s impact who took charge nine days before the 2016/17 season kicked off. 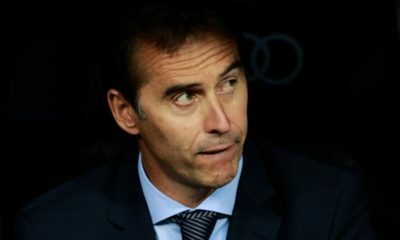 That Escribá has so far managed to pick up points against Real Madrid, Barcelona, Atlético Madrid, and Sevilla (twice) can be attributed to his tactical nous. Only Bayern Munich have conceded fewer goals than Escriba’s Villarreal this season in Europe’s top five leagues. Nasri’s involvement in early build-up play in the first half stunted Sevilla’s attacking threat. Despite being more advanced in the second half, his 49th minute penalty miss meant he tried to overcompensate without much luck thereafter. 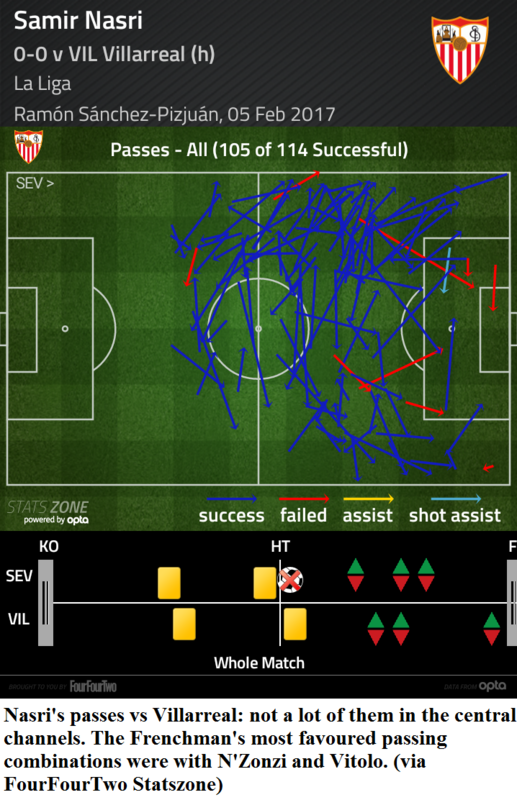 Sevilla had two-thirds of possession but nothing came of it. According to Michael Caley’s widely-endorsed expected goals model, Villarreal created the most dangerous openings (as per xG value) as shown by the two big yellow squares below. Villarreal’s solid defensive shape meant Sevilla never sustained their attacking threat. Some brilliant goalkeeping from Sergio Asenjo denied the home side on more than one occasion, hence Villarreal will be happier with the result than Sevilla.